The US Virgin Islands Flag features a white field with a simple version of the Coat of Arms of the United States of America. The coat of arms features a golden American Bald Eagle that is holding a sprig of green laurel in one talon and three arrows in the other talon and has a shield on its breast that is blue with red and white stripes in between a "V" and "I." The blue, red, and white colors of the shield are the same colors as the United States of America's flag. 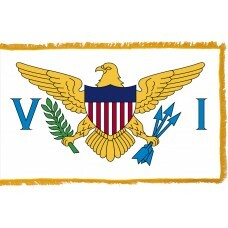 The Laurel represents the victory, the three arrows represent the three major islands, which are, St. Croix, St. Thomas, and St. John, the blue color represents the sky and the waters, the gold color represents the wealth, the white represents the peace and purity, and the green color represents the hills of the islands. 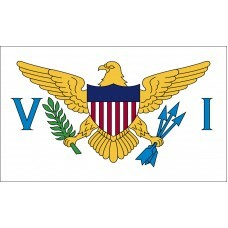 The "V" and "I" on each side of the eagle represent the Virgin Islands. The US Virgin Islands Flag was adopted on May 17th, 1921. The Virgin Islands are a group of approximately 90 islands that are located in the Caribbean that were administered into two groups which were the British Virgin Islands and the US Virgin Islands. The US Virgin Islands are the most Eastern part of the territory of the United States of America. The three major islands are St. Croix, St. Thomas, and St. John and are often referred to as "Twin City" (St. Croix), "Rock City" (St. Thomas), and "Love City" (St. Johns). The capital is called Charlotte Amalie and is located on the major island of St. Thomas. The capital city was originally called "Taphus" or "Tap House" due to the large number of taverns that the city had but after the 30 years, the Danes changed the name to Charlotte Amalie in tribute to King Christian V’s wife. The US Virgin Islands are bordered by the British Virgin Islands, Anguila, St. Kitts and Nevis, Venezuela, and Puerto Rico. The original inhabitants of the US Virgin Islands (officially known as the Virgin Islands of the United States) were the Ciboney, Carib, and Arawaks. The Islands were first discovered in 1493 by Christopher Columbus but were never settled by the Spanish. Christopher Columbus named the islands "Santa Ursula y las once mil virgenes" which translates as "Saint Ursula and her 11,000 virgins." In 1672, the island of St. Thomas was settled by the Danish West India Company, in 1694, the island of St. John was settled and in 1733, the Danish West India Company bought the island of St.Croix from France. In 1754, the islands became Danish Colonies. At the start of WWI, the United States of America approached Denmark to buy the islands as they feared they would get invaded by the Germans during the war. The islands were bought by the Americans from Denmark for 25 million dollars in gold. When the islands were a Dutch Colony, the economy was completely reliant on sugarcane that was produced by the slaves that were brought to the islands. Until slavery was abolished there were approximately 22,867 slaves on St. Croix, 4,634 slaves on St. Thomas, and 2,454 slaves on St. John. The slaves were known as the "Kamina Folk" as "Kamina" symbolized the land that was being cultivated and the black people that were working on the land. Today, the US Virgin Islands economy is mainly reliant on tourism and is a very popular attraction, especially for shopping.